About 5 years ago the ban on using personal electronics below 10,000 feet on U.S. flights was lifted. Almost everyone at some point mistakenly either left their phone on in their bag, or had some electronics turn on during the flight which they only realized later. And no Really. Bad. Things. happened. Nor did problems arise when pilots used tablets in the cockpit, either. The notion that $100 million equipment could be brought down by an iPod, or by 100 iPods, was the subject of ridicule. Now passengers can use their phones or tablets with the door closed, during taxi, and takeoff. But devices are supposed to be in airplane mode. This is the first time I’ve heard of a real consequence for not doing that – though as a result of something that would only occur with certain airlines in Europe, the Mideast, and Asia. A passenger received a $300 cell phone bill. 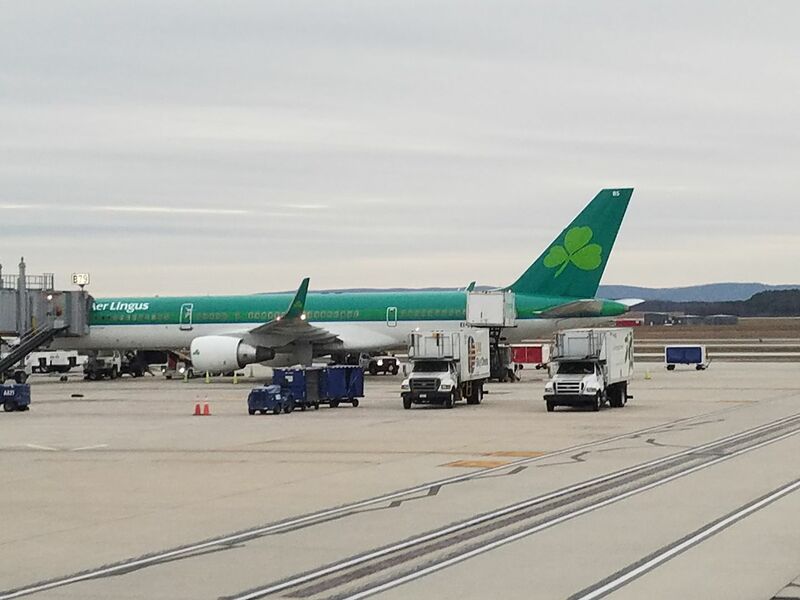 An Aer Lingus passenger returning to the U.S. left their AT&T cell phone signal on during flight and racked up roaming fees. [H]e left his phone on in the overhead compartment while travelling to the United States and ended up with almost $US300 ($AU409) in charges from his provider AT&T — the bill for which he only received weeks later. AT&T said the phone had connected to the plane’s antenna and used data that was “outside an unlimited international roaming plan”, which incurred the extra charges. Although it doesn’t always happen, the airline confirmed that passengers’ devices “may connect to the in-flight roaming network” without them opting into the fee-paying Wi-Fi network. Instead, the money is directly billed to the provider, as was the case in this instance. Like many airlines in Europe, the Mideast, and Asia, Aer Lingus offers AeroMobile for inflight calling. So he not only left his phone on but also had roaming enabled then? More fool him. Perhaps he’ll be more diligent next time. He should be happy that the FAA doesn’t choose to fine him also. This happened to me on an Etihad flight AUH-MAD before. I had data roaming on and forgot about it — but Etihad has a info card on my seat explaining the charges so I caught it before it was bad. I ended up with only $11 in data charges, but that was only for just over 1MB of use because they charge $9.99/MB!! Could be really bad if not caught. If you have data roaming on, there is absolutely no other opt-in required, the data will flow. Of course, there are also little things you can do on your phone that would minimize the data use when you are not actively using the device. Most of these are advertised as battery-saving features, but in general you can set the phone to only download messages when unlocked, and never to update software unless on wifi. I imagine most of this was email syncing, and there really is little point to collecting email on your phone when you aren’t using it. I’m amused that a passenger actually had his phone stowed the entire flight. I suppose these are the people that actually use the “inflight radio” channels. Low why not just get T-Mobile? I’ve had my phone lock onto phone service in Russia, Japan, Iceland, Saudi Arabia while flying over. And no worries. I don’t believe this would’ve prevented the issue, this is a special service not like a local carrier. Similarly, cruise ships are not included in the unlimited international plans. I got dinged with a $535 charge for roaming on a ferry; however the charges were reversed when I asked how much data that was and they said $35/G – I said ‘how fast is your network?’ Networks just aren’t capable of streaming that much data – in that amount of time ‘roaming’. That just happened to a colleague. He flew Royal Jordanian forgetting to turn off his phone. Turns out that while Jordan and Israeli roaming are both covered by his carrier’s plan, Palestinian roaming is not and he got billed a fair amount for roaming (less than $300 though) just after takeoff. @Dustin – see my comment above – T-Mobile covered Jordan and Israel but not Palestine. This happened to me on a recent LAX-FCO flight. Inadvertently left my AT&T iPhone on in-flight, and yes, in the overhead bin (the goal is to sleep going that direction). Once I realized the hundreds in charges I’d accrued during the flight a few days later, I called AT&T and explained what happened. They promptly reversed or credited (and perhaps ate) all the data charges. I am an 19+ year AT&T Wireless-then-Cingular-then-AT&T Mobility customer, FWIW. So, bravo to AT&T and a huge lesson learned for me: Turn off the damn phone. I’ve forgotten to put the phone in airplane mode and was surprised when suddenly messages and alerts started coming through over Greenland (at 35k feet) without wifi. Tested it on a different flight and was able to get a (very slow) connection in roughly the same area. A word to the wise: Several years ago, I had an unpleasant (tangentially related) surprise with a positive final outcome. I was traveling from Thailand to Laos and back. I’d called T-Mobile from Thailand to discuss roaming data. A co-worker had sent me a video that cost me $70. . We walked through the process and I turned off data roaming. (using hotel Wifi instead.) A couple of days later, we went to Laos for the day (land crossing); came back and thought nothing of it. A few days later, a $300 bill! I called T-Mobile and they refunded, (story backed up because of the previous call). No phone reboots over that time, just normal usage. The conclusion that the T-Mobile rep and I came up with was that somehow the carrier in Laos was able to toggle the data roaming back on. I can’t ‘prove’ it, but I’d sure check to make sure it’s off when switching countries. This just happened to me on EVA air to Taiwan, I was charged over $500! AT&T appears to be reasonable and will reverse the charges. I hope they do! Brutus on Why is Chase’s Sapphire Preferred Offering a 60,000 Point Initial Bonus?